Paris-based Japanese artist Yuki Onodera makes beautiful works using the photography’s unique natures such as light and shadows. Her works have been received major art awards both in Japan and internationally including Ihei KIMURA Prize (2003, Japan) and Prix Niépce (2006, France). 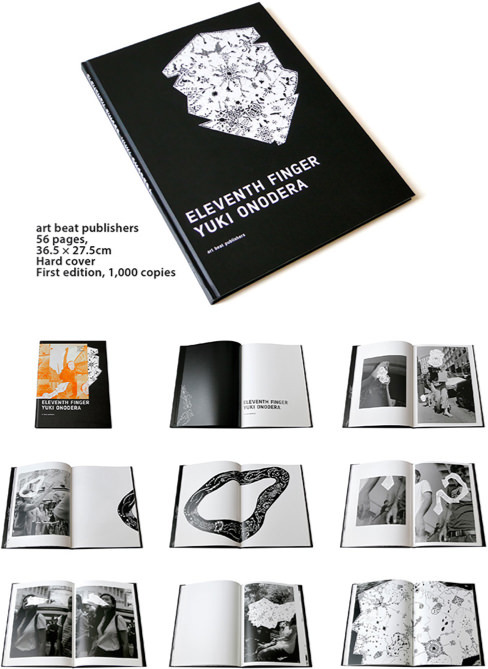 « ELEVENTH FINGER » is her ongoing project since 2006, using photogram and snapshots taken with hidden camera. The faces of the subjects are afterwards obscured by pieces of paper perforated in lacy patterns and applied to the photo through the photogram process. With the faces of the figures covered, their movements are rendered meaningless and somewhat comical; at the same time, it seems a comment of the right to privacy. The eleventh finger in the title is the finger of the photographer, taking the picture, in addition, of course, to the ten fingers of the subjects.